If you are looking for some serious SSD storage capacities, you might be interested in the new worlds largest SSD to date which offers a massive 100TB of storage and takes the form of the Nimbus Data ExaDrive DC100. Equipped with 3D NAND flash memory the 100 TB SSD is capable of providing storage for up to 20,000 HD movies, or 20 million songs, and is capable of read, write speeds of 500MB/s. Equipped with its patent-pending multiprocessor architecture, the DC100 supports much greater capacity than monolithic flash controllers and when used in data centres, a single rack of DC100 SSDs can achieve over 100 petabytes of raw capacity, says Nimbus. “Data centres can reduce power, cooling, and rack space costs by 85 percent per terabyte, enabling more workloads to move to flash at the lowest possible total cost of ownership” explains Nimbus Data. 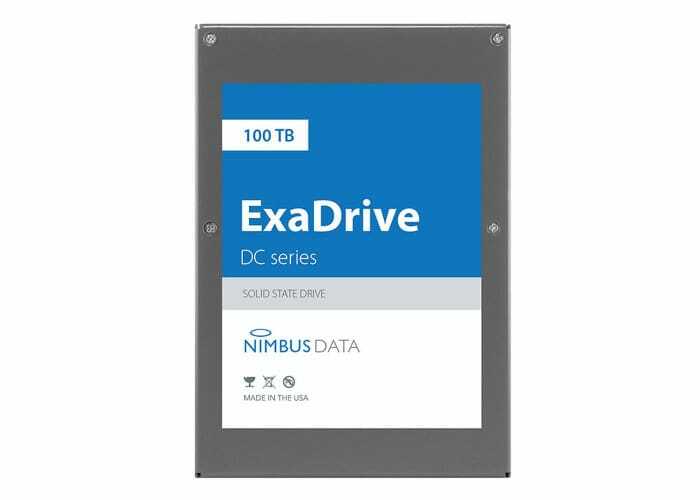 The new ExaDrive DC series solid state drives offer both 100 TB and 50 TB capacities and will be available to purchase during the summer months of 2018 although no pricing has been announced as yet by Nimbus Data.